Add plenty of seating to your living room with this sectional sofa. Track arms and metal legs at each end of the piece convey modern style, while foam cushions and loose pillows create soft and supportive comfort. With many sectional pieces to choose from, you are sure to find the perfect setup for your living space. The Savino Contemporary Sectional Sofa with Track Arms and Metal Legs by American Leather at AHFA in the area. Product availability may vary. Contact us for the most current availability on this product. 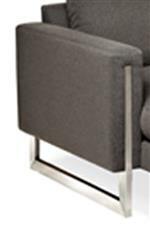 SNO-SQS-RA Left Arm Square Corner Sofa 1 95" 35" 32"
SNO-SO3-LA Left Arm Sofa Section 1 88" 35" 32"